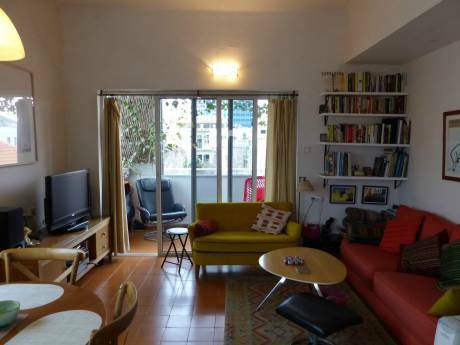 Our 110 sqm, 3 bedroom apartment is located in the "Old North" of Tel-Aviv, in one of the quiet streets off of Yehuda Hamaccabi street. We are on the 3rd floor (out of 3, with an elevator) of a small building with only 9 apartments. The apartment, which was completely renovated a few years ago, includes a large open-space living room, kitchen and dining area with a dining table for six which can open up to 10 if needed. The large (20 sqm) master bedroom includes a queen sized bed, a small work area and an en-suite bathroom and shower. Other bedrooms include one with a bunk bed (with an additional guest bed if needed) and another with a single bed (with an additional guest bed as well). There is a bathroom with a bath and shower for these two bedrooms. 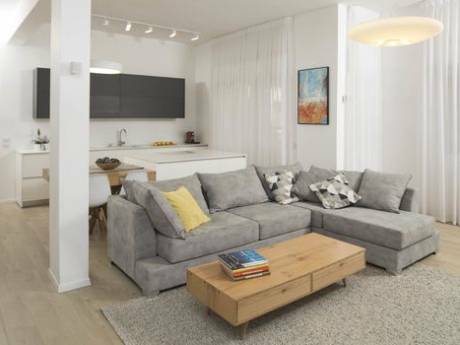 The building is typical to those built in the 50's in Israel with high ceilings and large windows, making the apartment very bright and inviting. The interior design is classic and peaceful, with many whites and pastels; though full of life, colorful books and toys as it home to a family of 5, with three vibrant children. We've also "confiscated" the roof, put up some shading and garden furniture, so if the weather permits - there are another 100 sqm for outdoor relaxation. It's not just ours so you might meet some of our neighbors there. 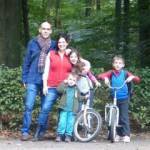 We are Yoram and Keren, both professionals in our 40's, with three children aged 8-16. With or smallest grown up enough, we have discovered the joy of traveling abroad together and experiencing new places through the eyes of our children. We already had three wonderful exchanges with families in Amsterdam , Berlin and the French countryside, and we feel it is the best way for us to travel and experience the local cultures. We are very well behaved(...) with great respect for privacy and will look after your home as if it were ours. We are looking for exchange companions with the same attitude towards our home. The "Old North" is a sought-after residential area in Tel-Aviv as it is comprised of relatively spacious streets, very quiet and green, yet still in the heart of the city and only minutes away from all the main attractions. We are close to Yehuda Hamaccabi street, which is a "neighborhood" of its own with all you will need for comfort and necessities, including two supermarkets, a bicycle shop, several barbers, a home depot and most importantly several quaint cafés in which we start many of our days with great breakfasts. There are also a few restaurants and 2 quiet pubs nearby. Hayarkon Park (Tel-Aviv's "Central Park") is 5 minutes away by foot, the new port area is 15 minutes away by bicycle as is the sea shore. The area has many bicycle lanes leading to most of where you will want to go, and we will be happy to let you use ours (2 grownup and 3 children's) though you can rent them on the street on a daily basis if needed. Reaching all the main attractions in Tel-Aviv, museums, theatres, restaurants and night life is easy by foot, bicycle, bus or cab as we are close to everything. We are a good location to those looking for a quiet retreat in a residential area (great for families), yet still in the beating heart of Tel-Aviv.